Chocolate treats made of moist brownie base, gooey marshmallow center and topped with crunchy chocolate-peanut butter-rice crispies. 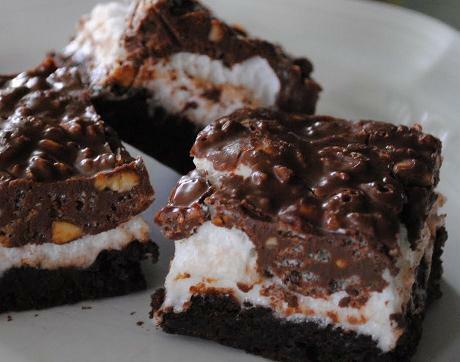 Here is an easy dessert recipe for Chocolate Marshmallow Bars. Preheat oven to 350°F (175°C). Slightly grease a 17 x 11 x 1-inch jelly roll pan with cooking spray. Set aside. 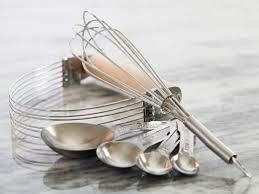 Whisk together flour, baking powder, salt and cocoa in a medium mixing bowl; set aside. In a large bowl, cream together the butter and sugar; add eggs and vanilla and beat until light and fluffy. Stir in flour mixture until just mixed; fold in nuts, if using. Spread in prepared baking pan. Bake for 15 to 18 minutes. Remove from oven and sprinkle marshmallows evenly over top; return to oven for about 2 to 3 minutes or until marshmallows are melted. Using a metal spatula dipped in water, spread the melted marshmallows evenly over entire bar-base. Cool. 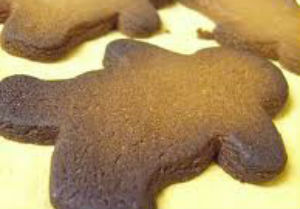 To make the topping, combine chocolate chips, butter and peanut butter in a double boiler and melt over simmering water. Stir in cereal. Spread over bars. 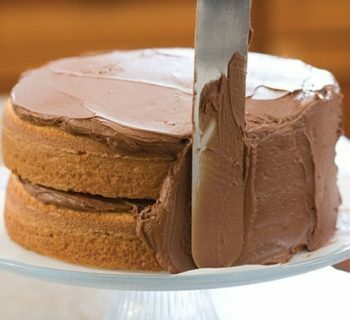 Allow chocolate to set before cutting into bars.